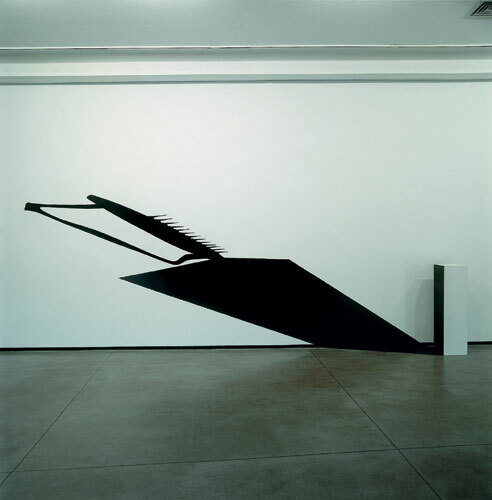 Regina Silveira explores anamorphic perspectives of well-known objects. 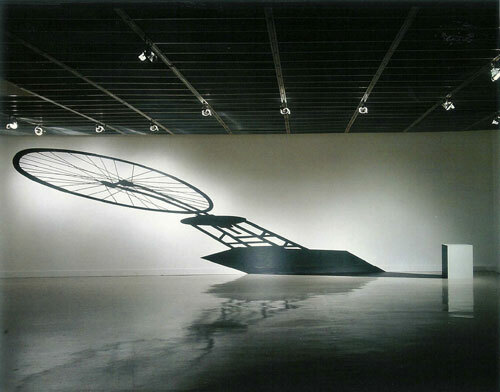 Regina has "anamorphosed" Marcel Duchamp Bicycle wheel and Man Ray iron with nails. Her technique is not new, Leonardo Da Vinci first experimented anamorphic perspectives. Hans Holbein the Younger created in his painting "The Ambasadors" the most famous and striking example of a hidden anamorphosis. Andreea Pazzo dome and vault of the Church of St. Ignazio in Rome represent the pinacle of anamorphic illusion. Andreea Pazzo was commisioned to paint the flat ceiling of the curch in such a way to create the illusion of a dome.